Last weekend the family and I went to the Guymon Community Theater presentation of “How to Succeed in Business Without Really Trying.” My mom and stepfather from Boulder, Colo., even got to go with us. They loved it as much as I did. The cast was fabulous. They made me laugh. And I respect each and every one of them for their hard work in making such a thing happen. Way to go, guys! I did notice in the program that many of the actors were in a production for the first time. I applaud them for stepping out and trying something new. I hope you enjoyed it as much as I enjoyed watching you all! Talking about doing something new … have you ever thought about hosting a high school foreign exchange student? Give Mary Ann Shaddy a call if that is something you might consider. My family hosted 18different students and loved most of them! It is certainly a way to travel the world without having to buy a ticket. The number to call is 580-651-1957. They’ll try hard not to get you a student that when you give him a penny for his thoughts, he gives you change. Here’s something new that I learned when the Governor was here talking: 45% of the students going into college are having to take remedial classes. That is almost half of the students. And if you figure most of the bad students aren’t even enrolled in college, this is a bit frightening. My thought is that it is time for parents to stop making excuses for your kids. They need to do their homework … themselves. They need to go to class and be on time. They need to write their own essays. Hire a tutor if your kid is having trouble because it’s cheaper than paying for a year of remedial classes in college. If you’re not willing to do their work for them when they get a job, buy their groceries and pay their rent when they get a family, then quit letting them get by when they’re younger. It isn’t helping them. Now, I don’t remember if the Governor was talking about Oklahomans or nationwide, but I don’t think it really matters. Even if the percentage is a bit exaggerated, it is still scary. At the recent Dementia Education Seminar that the Main Street Dementia Support Group sponsored, having author Tam Cummings in Guymon to speak, she spoke some words that have really stuck with me. Tam asked the group what Dignity of Life was. The group was quiet and then several people gave their thoughts, but it boiled down to being treated with respect. We should all treat people with dignity, with respect. And we should let them die with dignity. And we should treat those who are left living with dignity. Even children. I am going to remember this. Everyone deserves to know the truth. And if you handle it well, the children probably will, too. 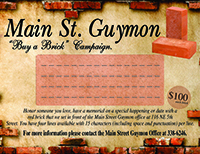 Speaking of analysis, we have had such a wonderful good time with our Cash Mob that goes once a month and mob shops at a Main Street Guymon member retail store that we’re starting a Lunch Mob! The Cash Mob promises to spend a minimum of $20 at each mob, but the Lunch Mob just promises to buy lunch at the mobbed member restaurant. At this time we have three restaurants as members. They are Pub on the Bricks, Urban Bru, and Vallarta. Oh, yes, and Dizzy B’s serves a great lunch, too. We hope that it is fun for the mobsters and that it encourages new members! We love giving back to our members and this is such an enjoyable way to do it. Mitchell Theater came in as a new member, so I think we’re going to have the two mobs mob the theater. Another fun time to be had! Call if you would like to join the Cash Mob and / or the Lunch Mob, 338-6246. Epic Saturday classes and events coming up on the 17th are Scrapbooking at The Studio from 9 am to 5 pm (call Denise Gebara at 339-4851 for more information); Gaggle of Geeks from 1 – 3 at the Main Street Guymon office; Dementia Support Group from 4 – 5 pm at the Main Street Guymon office; and from 8 – 11 pm is a country and western dance to the band “Calhouns” at No Man’s Land Center, 15th and East. Join any of these that interests you. You should also mark on your calendar that the Pink Heals Tour is in Guymon on June 21 and there is a Professional Bull Riding Event and Motorcycle Run on July 26. It’s a great day to be on the bricks.